On balance I read it as good news. I would have played EQNext, of course, but I have no love for action rpgs and I was expecting something barely recognizable as an Everquest MMORPG. The whole destructible world/voxel aspect always seemed nuts, as did the parkour movement. I guess we’ll see the remnants of that in Landmark, a game that I have some affection for still and which I will almost certainly play more when I finally upgrade my PC and have a system that can handle it. Looking ahead, perhaps the EQ and EQ2 teams will get at least a couple of their old devs back. They’ve both been doing a fantastic job post-SoE with extremely limited resources and this can only be good news for them. I do wonder about Holly’s workload now she’s in charge of Landmark too, though. What with the final withdrawal from open world PvP it looks as if the shadow of Smed is finally lifting for good. I’d love to think we might now get some new EQ franchise products that are less ambitious but more suited to both the market and the company’s resources. A mobile game surely isn’t out of the question? It’s ironic that our conversation happened so near to this big news. We were both really curious as to what was going to happen, and optimistic about what could be, and now the writing is on the wall. They sound like they are interested in some new Everquest product, but will it be too late at that point? I’m sad to see this happen because I was holding out that some day I’d be able to visit a new version of Norrath. It’s not impossible, but it doesn’t seem likely at this point. We need some talented modders to take up the reigns and give Norrath a fresh coat of paint. I have a post of my own incoming. @Bhagpuss – As I alluded in the post, a lot of people were projecting their dreams on the whole project, and the more we saw of it the less satisfied people started to become, I think it was in its ideal state for a few hours after that first SOE Live presentation about it. I am still mixed on Smed. Without him there would likely be no EverQuest as we knew it/know it. On the other hand, he did have his PvP agenda which, as I noted earlier in the week, ended up with mostly nothing for the effort when it came to Norrath. Sadness, but once I realized what Daybreak was I was sure this was coming. I would bet a lot that this was decided before SOE was sold, and Daybreak paid bottom dollar for a stable of older middling MMORPGs and a bunch of assets for a game that was already all but cancelled. Nothing I’ve seen indicates that they are anything more than a caretaker, certainly not a company capable of developing on the AAA level that EQN needed to be. Did you play FFXIV’s, and if so did you find its UI to be that horrible? I thought the interface was so well done that I chose to play it on a gamepad on my PC. I can still remember watching their live announcement secretly at work about EverQuest Next and that hokey sand story thing being made as they were going on about it. I was on board day one and sad to see it cut down before it had a chance. No, but I played DCUO on Windows and found the compromise console focused UI to be annoying. I didn’t try that one, but I guess that is more relevant since it’s from the (sort of) same developer. I will say if you ever want to see how good a UI for a traditional MMORPG on a console can be, try FFXIV. Playing on PC and swapping to the gamepad UI will gave you the same experience. I think this one really has to be on Smedley. He managed the development of this project for *years* across multiple iterations and never managed to come up with something good enough for release — even by the H1Z1^2 Daybreak team. That’s tragic, and in all likelihood pretty much the end of the line for the EQ franchise. Sad face. @TheBillMurphy Did you ask for that E3 Best of Show award back while you had him on the line? Now that EQN is gone, what I’d love to see is EQ2 redone in EQN’s engine. Don’t change the content or systems (OK, maybe re-itemize), just update the engine and graphics. And release it as “Norrath”. I’d be all over it. Sad to hear though not entirely unexpected. I do hope we will see the Storybricks/evolving AI campaign world aspect in another game with lots of races, though am also happy the action-combat is off the table, too. 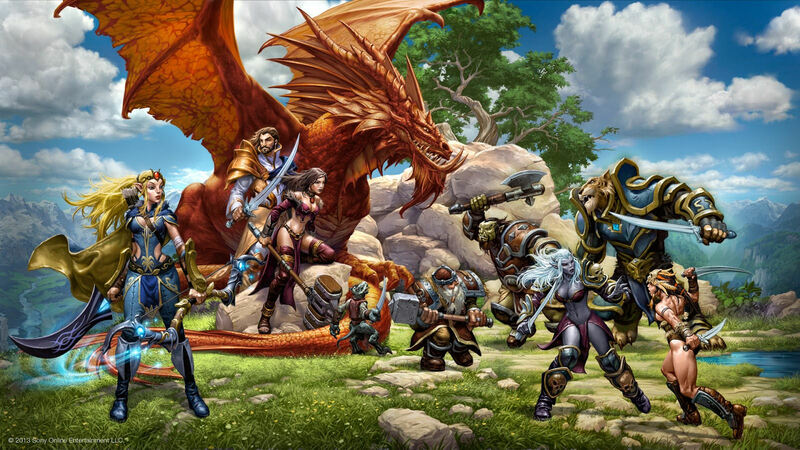 As soon as SOE was sold to a private equity firm, I knew it in my gut that Everquest: Next was dead. My brain didn’t want to catch up, of course, and my heart lagged even further behind, but private equity is ultimately more interested in the extraction of cash through management fees than building products. It is what it is, but I really, really wish Storybricks had been able to raise the funds to acquire SOE like they initially wanted to. It would have saved the game and its purity of vision at the same time, I imagine. Totally glad about this, but..
wait, what? Bhagpuss, are EQ Landmark and EQ Next are not the same thing? I just wish they’d entirely fix up the EQ1 gameland with latest rules, all zone gfx upgrades (I mean, they’re almost halfway there! ), fix the broken quest system for all quests, plonk down a few hundred new ones that make sense and ditch half a dozen of the worst add-ons (including their dysfunctional mythology) and… bring back corpse runs! Some how, some way.. make it REAL again! That could be EQ Next for me, only rebranded EverQuest Real. Now that I’d pay for! But I won’t pay for time-locked progression replays – I did that once already, and it cost me plenty. I’n not too surprised and not too sad. Nothing I heard about EQN I liked. Voxels I could live with. The characters didn’t look like anything I would want on my monitor. The whole Idea of being able to destroy the world which then regrows seems pointless. The video of Mr. Georgeson explaining how he would “release a band of orcs into the world” seemed so improbable that I was wondering why everyone did applaud. Finally I also disliked the movements and fights in the videos. The term action action rpg is quite fitting. And thet’s nothing I would buy into anyway.